Gordom Ramsay's first restaurant in France. : As the subject of his majesty, chef Gordon Ramsay could only make a royal entrance on the other side of the channel. 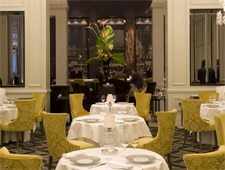 You'll enjoy sophisticated cuisine in a refined setting at this restaurant located at the Trianon Palace Versailles. The multi-course tasting menu is available for €143.